Cream together brown sugar and shortening. Add egg and molasses and blend well. In another bowl whisk together gluten free flours, xanthan fix, baking soda, cinnamon, cloves, and salt. Mix the dry ingredients into the wet mixture. Mix well. Cover dough and chill for 1 hour to overnight. When dough is chilled, roll the dough into balls using 2 teaspoons of dough per ball. Roll the ball in the sugar. Bake in a preheated 350 degree oven for 10 to 12 minutes. They will be puffed when just out of the oven, but will flatten in a minute or so. Allow the cookies to set for a couple of minutes on pan until they have set up a bit, then use a thin spatula to move then to a cooling rack. 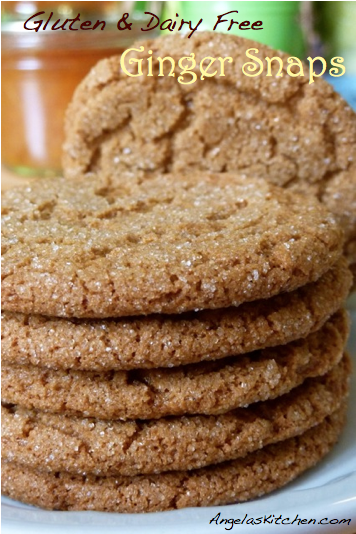 For smaller cookies (1½″ cookies) use 1 teaspoon of dough per cookie and bake for 6-8 minutes. To Freeze: Allow cookies to cool completely. Package in a freezer safe container using waxed paper or parchment to separate the layers of cookies. Hi, boy have you tried these with only tapioca starch (no cornflour) or substitute? We are also cornfree and my boy loves his gingernuts. I have used arrowroot and potato starch in this to replace the corn, but not tapioca. However, I do think it should work. Let me know if you try it an how it worked for you.